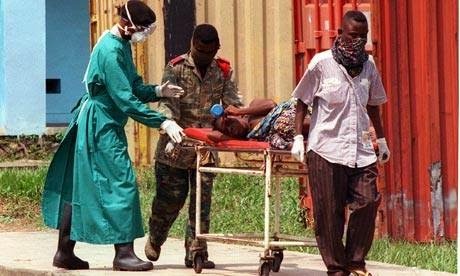 The World Health Organization (WHO) was notified on Sunday, May 25, 2014 of an Ebola virus disease outbreak in Sierra Leone. Preliminary information received from the field indicates that one laboratory confirmed case and four community deaths have been reported from Koindu chiefdom. This chiefdom shares border with the current Ebola virus disease hotspot Guéckédou in Guinea. The laboratory analysis of the case was done at the viral hemorrhagic (or haemorrhagic) fevers (VHF) laboratory in Kenema, Sierra Leone . 2. Deployment of a team to the field to conduct epidemiological investigations and initiated preliminary response measures and development of funding proposals based on the existing national Ebola virus disease preparedness and response plan. deployment of essential supplies and reagents. WHO does not recommend that any travel or trade restrictions be applied to Sierra Leone based on the current information available for this event.